This is one of those books by Schaeffer that I had missed reading when we were all reading Escape from Reason, How Shall We Then Live?, and The God Who Is There. In this book (first printed in 1971, containing 180 pages) Schaeffer applies the apologetic emphases of his other books into a practical guide for Christian living. His moderately Reformed background keeps the soteriology pretty straight while his gift as a communicator to the Baby Boomer generation blends doctrine and practice into a quest for true spirituality. 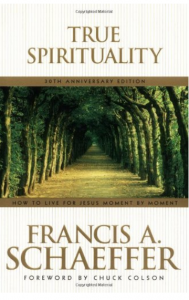 I found it a refreshing change from many of the formula books on holiness that are satisfied with some three-step approach to successful Christian living. Schaeffer’s approach is cross-centered, not self-centered.